999.9 fine gold bars spot price plus 2% and NO sales tax. 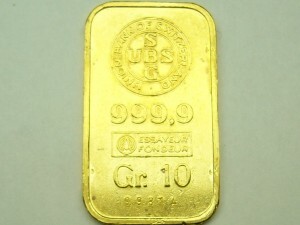 We have various sizes of 999.9 gold bars in stock. If you are looking for the perfect gift for someone who has everything try one of these. These bars are HST exempt. They are priced at the daily gold spot price plus 2%. The trend is showing gold going up, 10 years ago gold was selling for $800.00 per ounce today it is selling for close to $1600.00 CAD. To check an up to the minute gold price click here. This may be a great time to buy a bit. It never goes bad. Please contact us to make sure we have the size and amount you’re looking for before you come in. Ludwig II was king of Bavaria from 1864 until his death in 1886. He was Bavaria’s “Unser Kini” or “Cherished King” due to his passion for walking among the common people and chatting with farmers and laborers. He was known for the lavish gifts he would give to any common person who showed him hospitality. He was also known for his great love of theater, music, and architecture which he used to build up and celebrate the culture of Bavaria. With his own personal fortune (never the state’s money) he built two palaces and Neuschwanstein Castle; all of which, to this day, draw huge crowds of tourists to marvel at their intricacy and grandeur. Walt Disney’s magic kingdom castle was inspired by the Neuschwanstein castle. 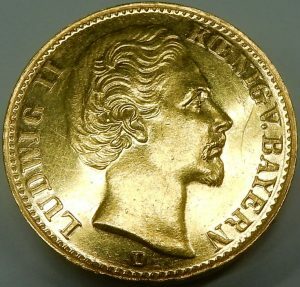 This very good condition, 7.91 gram, 90% pure gold coin was made for the 10th anniversary of Ludwig II’s succession to the throne. 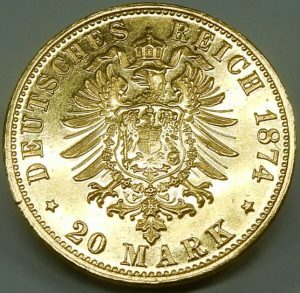 The coin was one year off from marking the exact middle point, and arguably the high point, of his 22 year reign, which ended in his mysterious death in June of 1886. Many believed he was murdered by Bavaria’s government who had three days earlier tried to overthrow the king under accusations that he was mentally ill. As he was in deep personal debt with a very aloof attitude towards matters of state, Bavaria’s government felt he was a threat to the country’s future. This coin is a wonderful celebration of a very complex life. Collectors price $550.00 CAD. Stock #e9807. 1oz. Canadian bullion coins. Gold price only plus 4% (HST exempt). 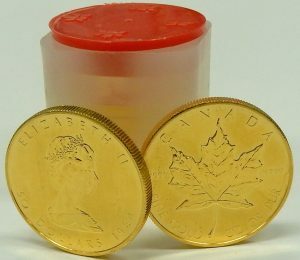 One of the most sought after bullion coins in the world is the Canadian 1oz. maple leaf. 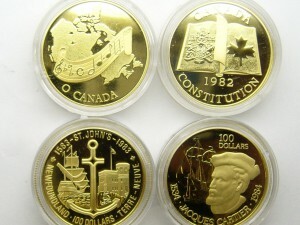 These coins were introduced in 1979 and are minted using Canadian sourced gold. They are the world’s first coins ever minted that are a minimum 99.9% pure. They are not subject to any sales tax. The Canadian Revenue Agency looks upon the sale of these coins as a “financial transaction” therefor not taxable provincially or federally. They can be difficult to find and quite often not available to us. We have received a few in stock recently so now may be your chance. No one knows where the price of gold is going but 15 years ago it was selling for around $500.00 per oz. Today as of this post it’s around $1600.00 Canadian. These coins are being sold for gold price only plus 4%. 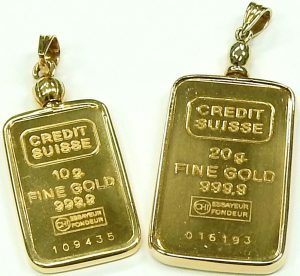 A good place to see the current price of gold and other precious metals is www.kitco.com No shipping, no extra fees, no waiting for delivery and the satisfaction of owning the actual physical metal. The perfect gift for the person who has everything. Call ahead first as they come and go quite quickly. You can’t get more rare or nostalgic than this. 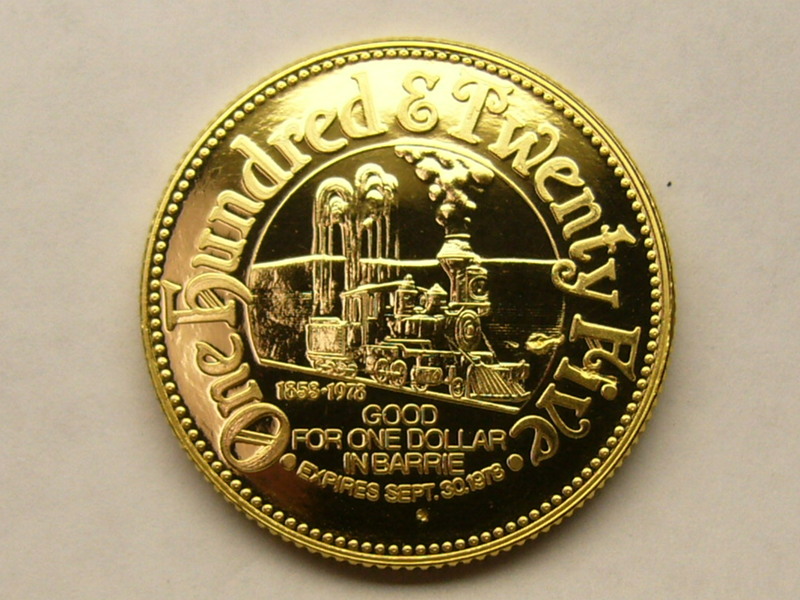 This is a 24 karat solid gold coin commemorating the city of Barrie’s 125th Anniversary in 1978. To our knowledge there is only one other coin like this and it belongs to the city from information I could gather. It was presented to the previous owner as a prize during the city celebration. The other side of the coin depicts the Barrie’s coat of arms. The coin weighs approximately 28.5 grams. The best part about this coin is there is no HST due to the fact it is 99.9% pure gold and revenue Canada looks upon this kind of sale as a “financial transaction” therefore not applicable to tax. The coin is for sale for “spot price” plus 25%. Stock #e5220. This is one very cool jewellery item. Each of these 90% pure gold coins are well over 100 years old, dating from 1881 and 1906. They’ve been expertly modified for use as jewellery. An attractive 4 petal, floral design bail was delicately soldered to each of the 21.6mm diameter coins. The craftsman who attached the 22 karat yellow gold bails did so with great care, making sure the gold solder didn’t bleed into the fine surface details. The large sturdy bail enables the coins to be worn on a variety of large chain or cord style necklaces. Don’t worry too much about the diminished numismatic coin collector value because of the modification. These are both relatively common coins with close to 8 million examples being struck. Each coin pendant weighs an average of 9.69 grams and contains approximately $475.00 CAD worth of gold (at current market price). As a suggestion we are showing the pendants on a black rubber and leather cord necklace with sterling silver clasps. The cord necklaces are available in a variety of lengths,colours and gauges. We are including one of these necklace options with the purchase of either coin for no extra charge. Each coin pendant and necklace is estate priced at $700.00 CAD. Stock #s e10438 and e10439. Some coins, especially the gold ones have all the right stuff to become objects of jewellery. They’re made from high quality precious metal, they’re usually of a reasonable size, they are somewhat rare (especially the antique examples) and most of all they are beautiful. Pendants, brooches, cufflinks, rings have all been made from gold and silver coins. Sometimes the transformation from currency to jewellery is simple and causes no harm to the coins. Other times they get holes drilled through them or they get components permanently attached with solder. At one point over the last 134 years the tail side of this coin had something soldered to it then removed. The telltale evidence of solder can easily be seen in two spots around the outer edge. I suspect the coin served duty as a brooch for some time. Although not an incredibly rare coin with over 200000 being struck its too bad this solder contamination can’t easily be removed completely. It’s still a great coin made from 90% pure gold with an actual fine gold weight of 0.48 oz. The gold value could always be obtained by recycling it, but that would be a shame. It’s still just too beautiful to suffer such a fate. The coin is being sold for only for the gold content it contains, no extra fees aside from applicable sales tax. Stock #e10600. SILVER SALE!!!!! Spot less 1% (minimum 10 oz. maximum 100 oz. purchase) NO HST. Sometimes we have a little too much of a good thing. 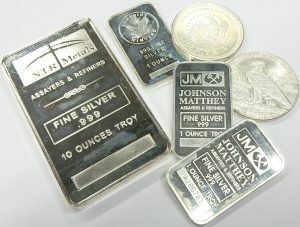 We love silver and seldom sell it but we have little more than we need at the moment. This sale isn’t going to last long and we don’t have 1000s of ounces to part with. 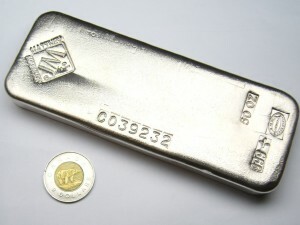 Smaller silver bars, wafers and rounds usually sell for 5 to 10% over its spot price. 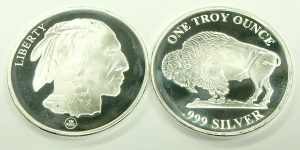 For a limited time we are all selling some of our overstock 999 fine silver for just 99% of its spot price. It’s like buying dollar bills for just 99 cents. The best part of buying fine bullion like this is there is no sales tax of any kind on this purchase. The Canadian Revenue Agency looks upon the purchase of bullion as a financial transaction therefore not subject to sales tax. All we ask of you is that you pay for it by cash, debit or e-Transfer. Credit card purchase will add a 2% service fee. We have various sizes, shapes and brands of 99.9% pure silver for sale and it’s on sale for a limited time for just 99% of spot price. For current pricing click here. First come first serve. There is a 10 ounce minimum and 100 ounce maximum daily purchase. Silver bullion is so inexpensive right now. 1 ounce of silver is over 85 times less expensive than 1 ounce of gold. The historic relationship of gold vs. silver price is closer to 40 to 1. There have only been 2 other times in history that I’m aware of when the silver/gold ratio has been higher than right now. This tells us that gold is overpriced or that silver is under priced. With all the chaos in the world at the moment my personal belief is both silver and gold are under valued but much more so in the case of silver. With silver pricing as low as it has been for the last few years we’ve slowly been acquiring silver but seldom (almost never) do we sell any of it. For all those people who call us asking for silver bullion here’s your chance. 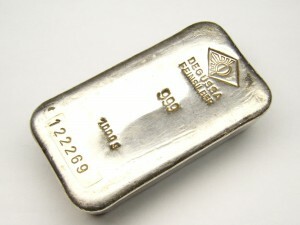 This 100 ounce bar of 9995 fine silver was made by Ohio Precious Metals LLC. The bar only measures around 6″ x 3″ x 1″ but is surprisingly hefty when you hold it in your hand. It weights just a little under 7 pounds. There is no HST on the sale of precious metals as Revenue Canada looks upon these sales as financial transactions therefore not subject to the HST. Everyone should own some bullion as security against the effects inflation has on your cash. This is one of only a couple 100 ounce bar we are selling at the moment. Estate priced at just $2,100.00 CAD (credit card purchases please add 2% service fee). First come first serve. Contact us immediately if you’re interested. Stock #e11962. Fraction pure gold non taxable coins rarely come up for sale. We get a good number of the full 1 oz. variety but 1/10 oz. examples are uncommon. This 2102 9999 purity Canadian maple leaf is perfect in every way. It’s never been out of its plastic container. Not a scuff, scratch or fingerprint can be seen. 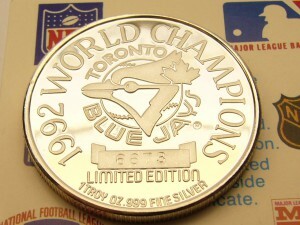 Most major coin dealers are asking around $250.00 for one of these if you’re lucky enough to even find one. 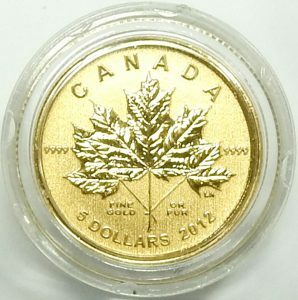 The 2012 $5.00 fine gold maple leaf is a relatively low mintage product, according to the Royal Canadian Mint this is one of just 25,000 made. We have one and one only. Estate priced at $200.00 CAD and no HST. There is no tax on the sale of precious metals, Revenue Canada looks upon these sales as financial transactions therefore not subject to any form of sales tax. Stock #e11805. Silver bullion is so inexpensive right now. 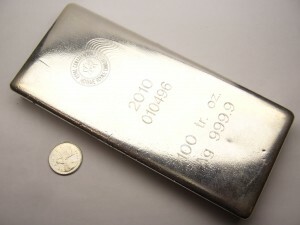 1 ounce of silver is over 85 times less expensive than 1 ounce of gold. The historic relationship of gold vs. silver price is closer to 40 to 1 and gold is only around 17 times more rare than silver. There have only been 2 other times in history that I’m aware of when the silver/gold ratio has been higher than right now. This tells us that gold is overpriced or that silver is under priced. With all the chaos in the world at the moment my personal belief is both silver and gold are under valued but much more so in the case of silver. With silver pricing as low as it has been for the last few years we’ve slowly been acquiring silver but seldom (almost never) do we sell any of it. For all those people who call us asking for silver bullion here’s your chance. 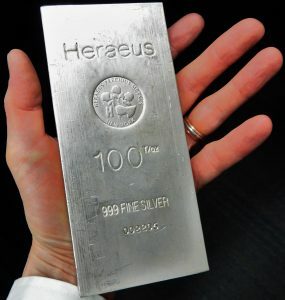 This 100 ounce bar of 999 fine silver was made by Heraeus Precious Metals New York. The bar only measures around 6 1/2″ x 3″ x 1″ but is surprisingly hefty when you hold it in you hand. It weights just a little under 7 pounds. There is no HST on the sale of precious metals as Revenue Canada looks upon these sales as financial transactions therefore not subject to the HST. Everyone should own some bullion as security against the effects inflation has on your cash. This is the one of the few 100 ounce bar we are selling at the moment. Estate priced at just $2,025.00 CAD (credit card purchases please add 2% service fee). First come first serve. Contact us immediately if you’re interested. Stock e11804. Invest in some tax exempt gold bullion and get a great piece of jewellery at the same time. 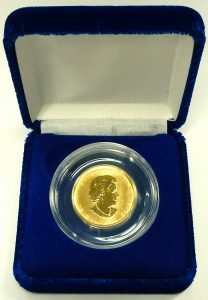 We usually have a few of these gold coins in stock for those who like to collect/invest in gold bullion but seldom do they come in as a beautiful and substantial jewellery item. 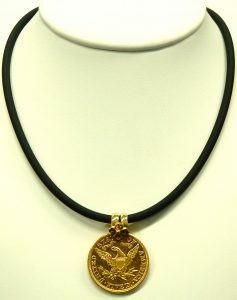 This necklace/pendant is truly an international collaboration; the coin of course was made at the Royal Canadian Mint and the 19 karat solid rope link necklace is likely from Portugal. Most of the 19 karat we encounter in our estate department has its origins in Portugal. 19 karat gold has a very rich colour that closely matches the hue of the 99.9% pure gold coin. The solid rope link necklace measures 20 in length and weighs 13.7 grams. The coin is secured in a hand made 14 karat yellow gold frame with a large jointed bail. The frame is well crafted with a thick polished bezel protecting the soft pure gold coin. 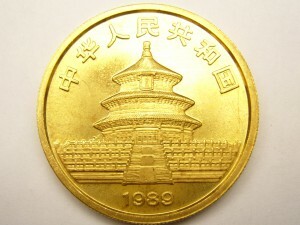 The coin dates from 1979. 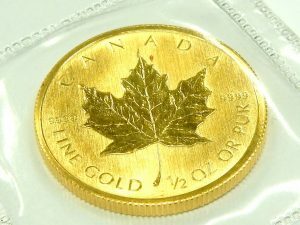 1979 was not only the first year of Canadian Maple Leaf coin production it also made Canada the first country to manufacture a pure gold coin. 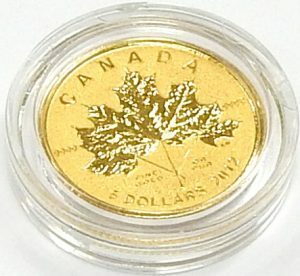 To this day the Canadian Maple Leaf is considered one of the finest and most pure gold coins available. 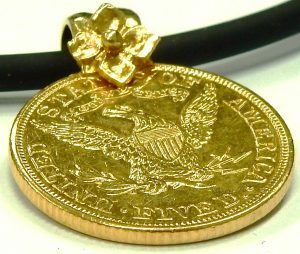 The coin portion of the pendant/necklace is sold for just the value of gold it contains plus 4% with NO sales tax added (this is the investment portion of the piece). The 13.7 gram chain and 4.1 gram frame are priced separately for $1,596.00. The total price of this item will fluctuate with the price of gold. As of today (Feb. 6 2019) pure gold selling for $1,729.00 CAD per ounce. The chain and pendant are both in excellent condition. The coin shows patina form use but has never been polished in any way. The set is priced at $3,394.00 CAD (subject to change with fluctuating gold price). Stock #e11975. Both of these wafers were manufactured and certified by Valcambi Switzerland with one privately labeled for Scotiabank Canada. Valcambi are one of the largest metal refiners and thought to be the biggest refiner of gold in the world. Each package is individually serial numbered, still sealed in the factory plastic packaging. The best part about a fine bullion purchase like this is there is no sales tax. It’s a true investment that is looked upon by the Canadian government as a financial transaction and therefore not subject to any form of sales tax. The cost for each wafer changes with the price of gold. 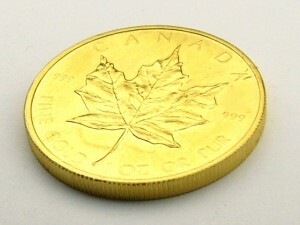 You can check the current price of pure gold in Canadian dollars or most other international currencies at Kitco.com. Each coin is priced at current “spot price” plus 2%. We can accept payment in both CAD or USD. We are unable to accept credit card payment for these coins. Everyone should own some gold bullion as a small component of your investments. Buy one, buy both, they make great gifts for that difficult person to buy for who has everything. Stock #e11786 and e11787. We almost never sell fine silver, but sometimes it begins to pile up and we need to free up space. 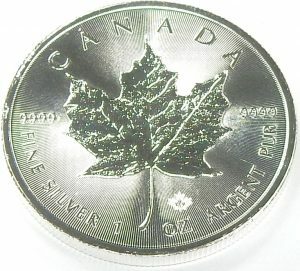 We’ve been buying it for years but rarely do we sell it, especially when silver seems so inexpensive at well under $20.00 CAD per ounce. This Royal Canadian mint tube of 25 just came in. They’re all in perfect condition and they’re all 2013s. If you don’t own any silver now’s your chance to get into the bullion market with these. They are being sold for the silver spot price plus just 10% and no HST. The price changes every minute. For an up to the second price in Canadian dollars click here. We are selling this tube and this tube only. First come first sold. If you want them email us at info@BillLeBoeufJewellers.com give us a call at 705 728 3343 or come in ASAP. 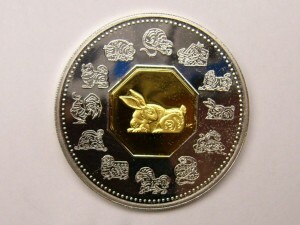 The major bullion retailers sell these coins for at a minimum of spot plus 15% (in volume of at least 25 coins). These are likely the best value currently on the market. Sold as a set only for just spot silver price plus 10%. Stock #e11795. Credit card purchase please add 2%. You’re not going to find a more efficient way to buy a great piece of jewellery plus make a sound investment as with this pendant. 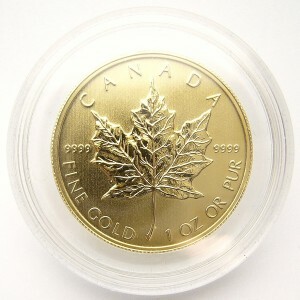 At the heart of the pendant is a fine gold Canadian Maple Leaf coin consisting of 1 ounce of 99.9% pure gold. This particular example is from the introductory year of 1979. 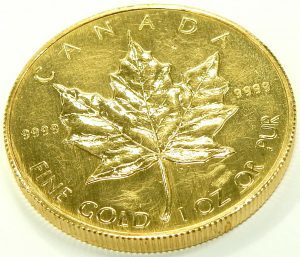 Canada was the first country in the world to produce a pure gold coin. 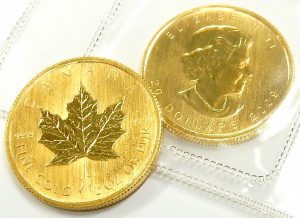 Canadian Maple Leaf gold coins are one of the most trusted and sought after bullion coins. 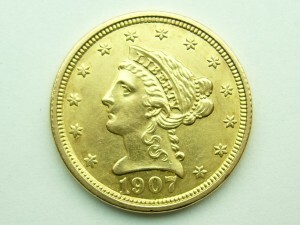 Collectors, gold investors and people who just love gold keep these coins as beautiful objects and investments alike. The coin and frame are both being sold for just their gold content plus 4% and HST on the frame value only. 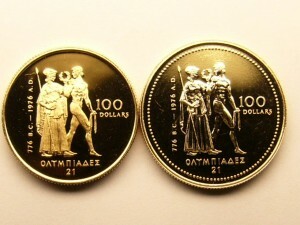 The coin weighs exactly 1 troy ounce (31.1 grams), the 14 karat gold frame weighs 3.8 grams. At the current gold price ($1,613.00 CAD per ounce) the complete pendant is only going to cost you $1,813.00 CAD (tax included for Ontario delivery). It’s the perfect gift for the gold bug, jewellery lover and bullion investor. Although we usually have other Canadian gold maple leaf coins available this is the only one currently set in a pendant frame. Get is while you can. The price will fluctuate with the price of gold. Replacement value with new would be significantly more. Stock #e11785. We almost never sell fine silver. 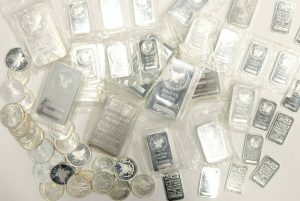 We’ve been buying it for years but rarely do we sell it, especially when silver seems so inexpensive at well under $20.00 CAD per ounce. This Royal Canadian mint tube of 25 just came in. They’re all in perfect condition and they’re all 2018s. 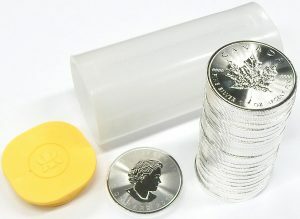 If you don’t own any silver now’s your chance to get into the bullion market with these. They are being sold for the silver spot price plus just 10% and no HST. The price changes every minute. For an up to the second price in Canadian dollars click here. We are selling this tube and this tube only. First come first sold. If you want them email us at info@BillLeBoeufJewellers.com, give us a call at 705 728 3343 or come in ASAP. Sold as a set only for just spot silver price plus 10%. Stock #e11620. Credit card purchase please add 2%. We get an amazing variety of interesting jewellery and precious objects at Bill Le Boeuf Jewellers. You never know what may turn up in the store or on our estate website pages. Although we’re not coin experts by any means we love the artistic and intrinsic value of all things beautiful including coins. When you look at this $5.00 U.S. coin from 1909 it’s hard not to be inspired by the emotionally stirring images each side portrays. Never mind the antique significance, rarity and actual gold value of the coin; the artistic value alone is reason enough to purchase something like this. This coin weighs 8.350 grams and is of 90% purity. In over 100 years, only 0.009 grams of weight has been lost due to wear and tear. The small scratches and scuffs that come with age give character and patina to the coin. Not being coin specialists we are selling this coin for just 10% over the actual gold value. The actual fine gold content of this coin is 0.2416 oz. The price fluctuates every minute with the price of gold. To find the current price of gold (in Canadian funds) click here. Once you know the price of gold per ounce, just multiply by the weight of 0.2416 plus 10%. We only have one and it’s available to the first person who appreciates the value and beauty it represents. Stock #e10598. I’ve got to hand it to the Americans, not many countries produce coins with such inspirational images. No matter political perspective the people of the United States are as patriotic as any nation in the world. The symbolism of this coin is uplifting and encouraging, you can’t help but get a positive feeling when you look at it. At over 100 years old the condition is very good. The edge of the coin is decorated with additional stars instead of the usual “coin edging” seen on most others. It was struck from 90% pure gold and contains 0.4839 oz. of the precious yellow metal. We are not coin experts at Bill Le Boeuf Jewellers but we know gold and we know beautiful things. It is priced at just 10% over the current price gold is trading at. Buy it for it’s antique appeal, the intrinsic value or just the beautiful images and how it feels in your hand. These old coins don’t come by very often. Estate priced at gold value only plus 10%. Stock #e10599. Hurry up. Spot plus only 5% on fractional bullion and NO tax never happens. 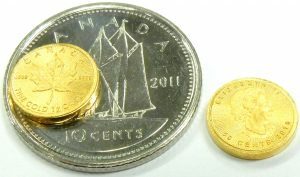 These smaller gold coins usually trade at the current bullion “spot” price plus at least 10 to 15%. Not only is it a great price, these coins are untouched, still sealed in a protective plastic package. 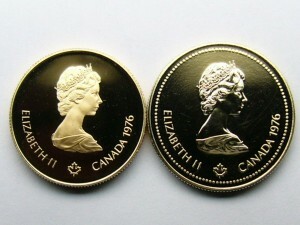 In 1993 and 1995 the Canadian mint produced 158,452 and 127,596 of these little coins. They’re certainly not a rare coin but that doesn’t mean they’re easy to find. We hardly ever have anything other than the full 1 ounce versions for sale. Those who have them usually squirrel them away and are always on the lookout for more. First come first serve on this coin. We only have the 2 so don’t waste time thinking about it. Call us, email us or come in right now! Please add 2% for credit card payment. Stock #e11231 and e11232. Sometimes you can make a pretty convincing argument that jewellery can be an investment. In this case there is no doubt these pendants are a wearable investment. 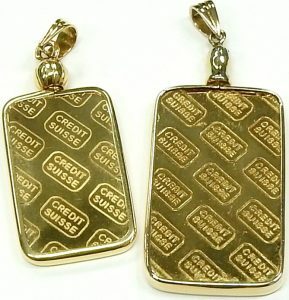 Most of the value in the two pendants comes in the form of pure gold wafers that are sold tax free. The only sales tax we need to collect is on the portion of value the 14 karat yellow gold frames represent ($137.00 and $207.00). Each wafer is made by Credit Suisse. This giant Swiss multinational investment banking company has been around since the mid 1800s and had revenues approaching 30 billion dollars last year. If you ever want to sell a wafer the threaded bale can simply be unwound to release the bar. This method of securing the fine gold ensures it doesn’t get contaminated with solder. It also allows us to sell you the individual parts so the sales tax only needs to be collected on the frame section. 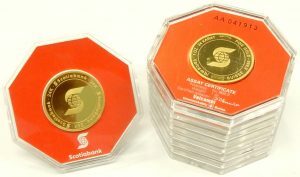 At current gold levels ($1560.00 CAD) the wafers are worth $520.00 and $1040.00 including our 4% markup. If your a gold bug buy them both as a his and hers set. They are also available for purchase separately. Stock #e11589 and #e11590. Please add 2% for credit card purchase. 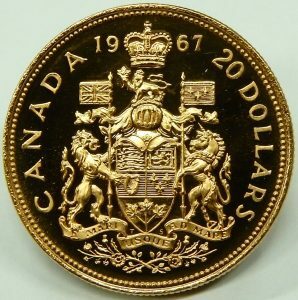 1967 Canadian Centennial $20.00 gold coin. Just 95% of spot price. 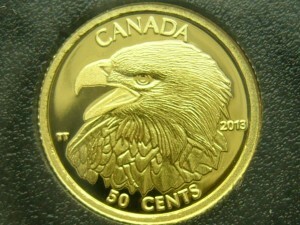 Canadian Centennial $20.00 gold coins being sold for just 95% of the actual gold value. These were struck by the Canadian mint as part of the commemorative series of coins for Canada’s 100th anniversary 50 years ago. 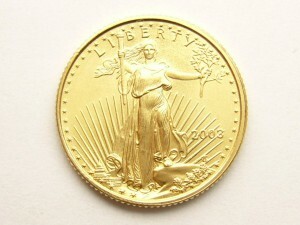 Each of the 337,688 $20.00 gold coins produced are of 90% gold purity and contain 0.5288 oz. of actual fine gold. They are being sold on a fist come first sold basis only. Just to make it clear; we are selling each coin for 5% LESS than the actual gold value they contain. There is no catch. If you know a proud Canadian who would appreciate such a gift come and get one while you can. We only have a few available. For a current price check of gold clickhere. Please add 2% if payment is made using a credit card. It’s been a while since the last 999.9 fine gold bar was offered. Gold has come off its highs of close to $1900.00 Canadian dollars. Now might be a good time to diversify your investments and buy a little of the precious metal. Purchasing this bar is HST exempt as the Canada Revenue Agency looks upon this as a financial transaction subject to no taxes. 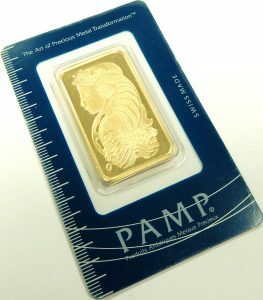 Our stock is always changing with various types of bars, sometimes they’re private label examples from a large bank or occasionally we get beautiful Pamp Suisse examples still in their sealed packaging. There is something very special about pure gold, the look, the feel, and the density are easy to fall in love with. Once you’ve held some you realize what all the fuss is about. This untouched example is estate priced at spot price of gold plus 2%. No waiting and no extra shipping fees. 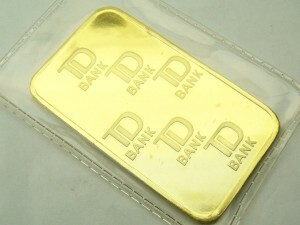 Always contact us first for availability as we don’t always have bullion on site. These bars come and go all the time. 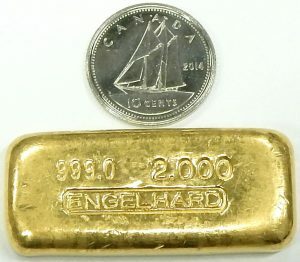 Rare poured Engelhard 2 ounce fine gold bar. Spot price plus 20%, no bank fees, no shipping fees, no waiting. This is an HST exempt sale. Believe it or not this bar is quite collectible amongst gold bugs. They don’t come to market very often and they always sell for well above spot price. Once they are purchased they are usually squirreled away never to be seen again. There is no sales tax on a fine gold purchase like this. Gold has pulled back from almost $1900.00 a number of years ago per ounce to around $1700.00 CAD as I write this. Who knows where the price will be in the future. Everyone should own a little of the only real internationally recognized currency that has a 5000 year history of retaining value. Gold is incredibly dense, it is 19.32 times heavier than an equal volume of water. Our little bar is surprisingly compact, occupying a space of around 3.25 square centimeters. 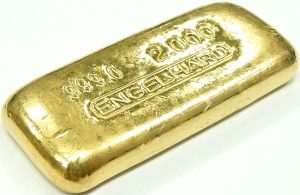 Engelhard refinery is no longer around and these poured bars are quite rare now. 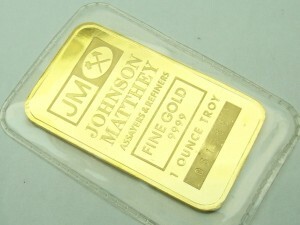 This bar has an actual weight of just over 2 troy ounces at 62.26 grams. Estate priced at actual gold value plus 20% and no sales tax. Stock #e8969. 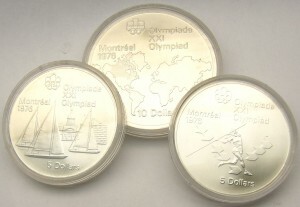 A nice example of the 1976 Montreal Olympic $100.00 coin. It weighs 16.96 grams and is made from 22 karat gold. Comes in it’s original wooden box with certificate. Estate priced at spot gold price only, no premium added for NON credit card purchase. This coin contains 1/2 an ounce of fine gold. You can buy this gold coin for 5% less than the actual value of gold it contains! Current price of gold can be seen here. Shipping to domestic destinations only. Stock #e6129. Canada 1976 Montreal Olympics. Gold value less 5%. The 2 coins are Canada’s first $100.00 coins ever minted making them just a little more unique. Made to celebrate the first Olympic games ever held in Canada. The smaller coin is made from 22 karat gold and contains exactly 1/2 ounce of pure gold. 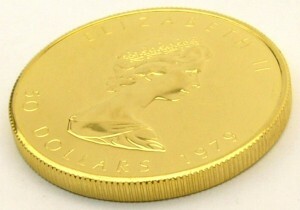 The larger coin is made from 14 karat gold and contains 1/4 ounce of pure gold. They are each priced at 5% less than the value of gold each contains! We have a limited number available, call before you come in. These make great gifts and are in great condition. Scotiabank 999.9 24k 1 oz. wafers. Spot plus 2%. You could buy a good used car for the price of these 9 round gold wafers but we all know what sort of investment a used car is. Ten years ago that car cost $40000.00, today it’s worth $15000.00 (if you’re lucky), ten years from now it’s worth a couple hundred bucks at the scrap yard. Today all 9 wafers will cost you just over $15000.00 CAD. Ten years ago they would have cost about $7200.00. Who knows what they’ll be worth in 10 years, but I imagine they’ll be worth a whole lot more than that rust bucket you thought was pretty cool. Coins don’t rust, they don’t break down, and you don’t have to fill them with fuel every week. You can buy them as a passive investment and sell when the time is right. 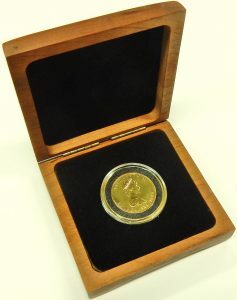 We offer 1 ounce fine gold coins and bars from time to time but seldom do they show up in lovely untouched presentation boxes. These wafers were manufactured and certified by Valcambi Switzerland and privately labeled for Scotiabank Canada. Valcambi are one of the largest metal refiners and thought to be the largest refiner of gold in the world. Each package is individually serial numbered. The best part about a fine bullion purchase like this is there is no tax. It’s a true investment that is looked upon by the government as a financial transaction and therefore not subject to any form of sales tax. The cost for each wafer changes with the price of gold. 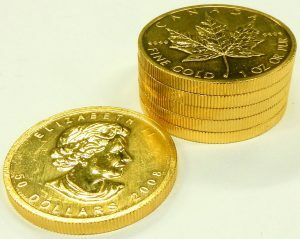 You can check the current price of pure gold in Canadian dollars or most other international currencies at Kitco.com. Each coin is priced at current “spot price” plus 2%. We can accept payment in both CAD or USD. We are unable to accept credit card payment for these coins. Everyone should own some gold bullion as a small component of your investments. Buy one, buy 2 or buy them all. First come first serve. Stock number e11108. You a cop, know a cop, wanna be a cop? How could you say no to this commemorative pure silver coin from the Royal Canadian Mint. I can’t think of a better gift for you favorite man in blue. These coins have been minted in a limited edition of 10,000. 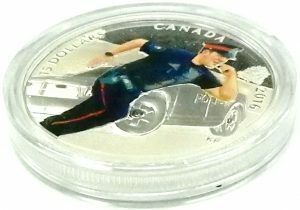 According to the Canadian Mint website there are only about 900 left, each priced at $69.96 plus shipping. They are from the Canadian Heroes series that also include a special coin in honor of our military and paramedics. The coin is 99.99% pure silver and weighs just under 3/4 of an ounce. This is a tax exempt purchase not subject to provincial or federal sales tax. 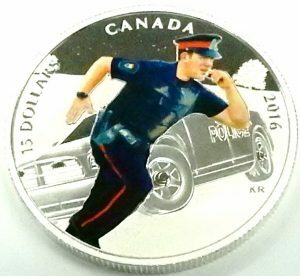 The coin is legal currency in Canada with a $15.00 face value. Perfect condition and only removed from its protective plastic case for a couple of quick photos. We only have one and when it’s gone it’s gone. Estate priced at $40.00 CAD. Stock #e11230. Sure we could just melt it down and sell the 0.9677 oz. of pure gold this coin contains but we feel destroying such a pretty thing would be a shame. Considering it has been around for 136 years it is in remarkable condition. The US mint produced 1,125,000 of these coins in 1882. While such a number seems high, consider this perspective; there were only about 1 of these coins for every 50 citizens in the United States according to the 1882 census. That sounds about right as most people of the era wouldn’t consider carrying such a large amount of cash with them. 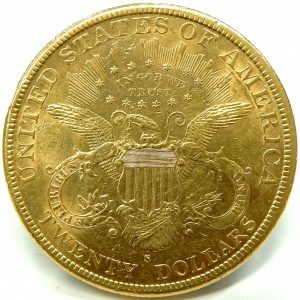 The average wage in the late 1800s in the United States was typically around $2.00 to $3.00 per day, making the coins value equivalent to about to 2 weeks work. Today (Jan. 31 2018) its gold value is around $1600.00 CAD, or about the same as 2 weeks work at today’s wages assuming 40 hours per week at $20.00 per hour. Amazing how some things stay the same. The value of gold’s purchasing power has remained remarkably stable over the centuries. Having a little gold is usually a pretty safe way to protect yourself against the effects of inflation. Rare, not really, but we still don’t see these old coins too often. We are selling this coin for just 5% over the actual value of gold it contains plus applicable tax. Stock #e11053. Got a difficult person to buy for this year? I bet they don’t have one of these. Canadian 1 oz. 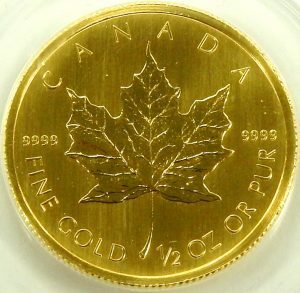 fine gold maple leaf coins are one of the most sought after bullion coins in the world. 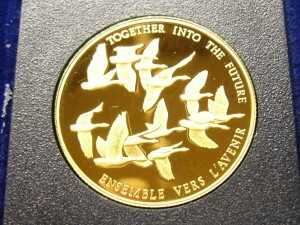 These coins were introduced in 1979 and are minted using Canadian sourced gold. They were the world’s first ever pure gold bullion coin. They are a minimum of 99.9% pure and are not subject to any sales tax. The Canadian Revenue Agency looks upon the sale of these coins as a “financial transaction” therefore not taxable provincially or federally. They can be difficult to find and quite often not available to us. These six examples just came in. They are all from the year 2008. This may be a good opportunity to pick one up. No one knows where the price of gold is going but 10 years ago it was selling for around $700.00 per oz. Today as of this post it’s over $1600.00 Canadian. These coins are being sold for gold price only plus 4%. 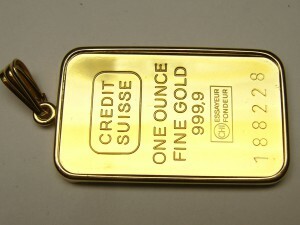 A good place to see the current price of gold and other precious metals is www.kitco.com No shipping, no extra fees, no waiting for delivery and the satisfaction of owning the actual physical metal. First come first serve. Call ahead first as they come and go quite quickly. Please add 2% for credit card purchases. Stock #e10892-e10897. A lot of people have some cash squirreled away for a rainy day. That’s probably a pretty smart thing to do; you never know when you’ll need a little cash. The problem I see with that plan is that inflation will slowly erode the buying power of that cash. We recently experienced just this effect at Bill Le Boeuf Jewellers. A client of ours came in and purchased a nice pair of diamond earrings for his wife. He paid for the purchase with a $1000.00 bill his father gave him literally over forty years ago. His father left it to him with the instructions to, “buy something special with it”. The diamond earrings purchased for his wife certainly qualified as special but what if he just bought some gold and left it alone for the same 40 years. 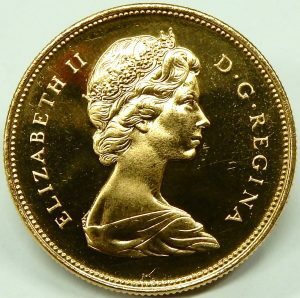 $1000.00 CAD back in 1977 would have purchased around 7 ounces of gold that today are worth over $11500.00. We’ll never tell you gold is the best investment you can make but it has historically protected people against the effects of inflation compared to holding on to your cash. Perhaps everyone should hold on to a little gold for a rainy day. You can easily convert your gold to cash when the time comes along. We usually have a few ounces available for purchase. These 2 1/2 ounce examples are a little less common than the full ounce coins we usually come across. One is still in its protective plastic packaging, untouched by anyone. 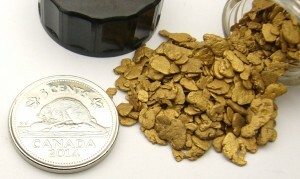 Pure gold is available tax free, no provincial or federal tax is applied to the purchase. The government deems the purchase of bullion as a financial transaction not subject to sales tax. The coins are available for just the value of gold it contains plus 5% (7% for credit card purchase). Up to the second gold pricing in most major world currencies can be seen here. Available separately. Stock #e11110. Believe it or not these gold coins are actual legal tender in Canada with a face value of 50 cents. 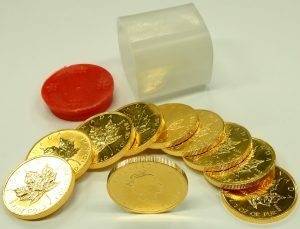 They each weigh 1 gram and are made by the Royal Canadian Mint. The coins are 99.99% pure gold and are not subject to any type of Federal or Provincial tax when purchased. 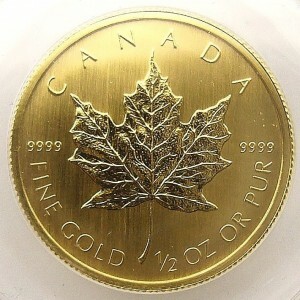 We see Canadian Maple Leaf coins with some degree of regularity in the 1 ounce size and occasionally in fractional sizes. This is the first time we’ve ever had such small versions. We’re pricing them for just the gold value each contain plus 10%. 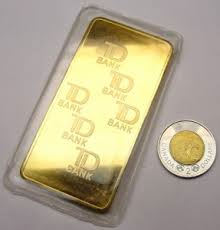 With gold priced at around $1600.00 per ounce Canadian that makes the price about $56.60 CAD each. 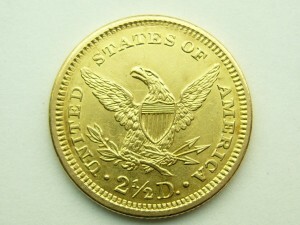 Small denomination gold coins are hard to find and don’t stay around here for very long. We can’t place these on hold. If you want one or both contact us NOW by phone 705 728 3343, email info@BillLeBoeufJewellers.com or come in ASAP. Both are in very good condition and dated 2016. Estate price at metal value only plus 10%. Stock number #e10763. We’re not usually sellers of silver bullion at Bill Le Boeuf Jewellers. Over the past few years we’ve sold very little but bought almost every ounce offered to us. Every once in a while we like to let go of nice tidy silver bullion item. This attractive 25 ounce tube of Canadian maple leaf coins from the Royal Canadian Mint is just such an item. Every coin in the tube is in uncirculated condition and all are dated 2016. Fine 9999 silver is very hard to find at reasonable prices and they almost never appear around here in the original RCM shipping tube. Fine gold and fine silver is not applicable to any form of sales tax in Canada. The Canadian Revenue Agency deems the sale of fine bullion a financial transaction not subject to Provincial or Federal sales tax. Make today Friday the 13th. a lucky day for you by investing in a little silver. The coins are being sold as a complete set of 25 for the estate price of $600.00 CAD and NO TAX!!! Please add 2% for credit card purchases. Stock #e10774. Price subject to change as commodity prices fluctuate. Hurry up. Spot plus 5% on fractional bullion and NO tax never happens. 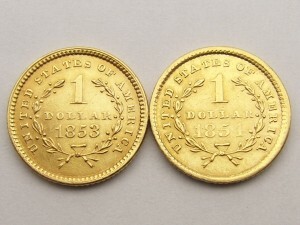 These smaller gold coins usually trade at the current bullion “spot” price plus at least 10 to 15%. Not only is it a great price, this coin is untouched, still sealed in a protective plastic package. 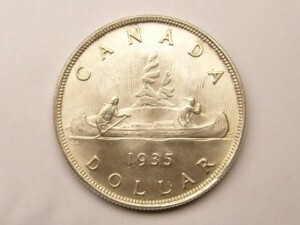 In 1984 the Canadian mint produced 262000 of these little coins. They’re certainly not a rare coin but that doesn’t mean they’re easy to find. We hardly ever have anything other than the full 1 ounce versions for sale. Those who have them usually squirrel them away and are always on the lookout for more. First come first serve on this coin. We only have 1 so don’t waste time thinking about it. Call us, email us or come in right now! Please add 2% for credit card payment. Stock #e10525. With the current price of silver this low we normally wouldn’t be selling, but right now we’re a little overstocked so here’s you chance. For all those people who have been calling looking to purchase this type of tax exempt bullion, come and get it. We have a limited supply of these RMC Buffalo rounds for sale at current silver spot price plus 10%. The price changes moment to moment, for an up to the minute price check click here. You’ll see the price of silver and other precious metals in all major world currencies. 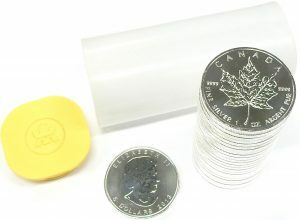 These 1 ounce 99.9% pure coins are all in perfect condition, still in their protective plastic tubes. These American made coins come from Republic Metals Corporation. 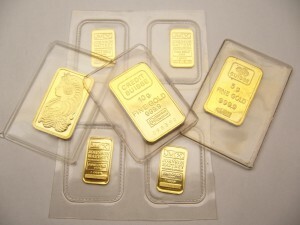 RMC are refiners and manufacturers of many popular gold and silver bullion products. You can buy a 400 oz. 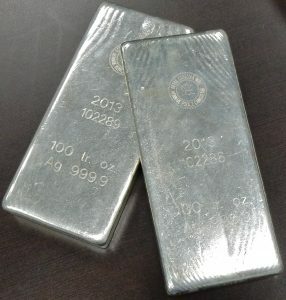 fine gold bar from them worth about $630000.00 CAD at current market value, to these small 1 ounce silver Buffalos. Sold as complete tubes of 20 only. If you only want a few, come in with a friend and split the cost. These complete, perfect condition specimens don’t come in often. Limited supply and we can’t repeat this offer. First come first serve. Payment by cash or debit. Credit card payment will incur a 2% service fee. Stock #e10246. B.C. 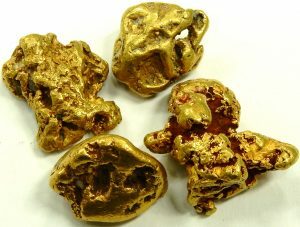 natural gold nuggets 49.9 grams. Spot gold price plus 25%. Looking for a Yosemite Sam worthy investment? 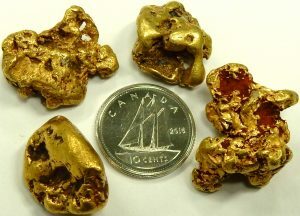 These natural gold nuggets from British Columbia will get your inner prospector’s attention. The four nuggets weigh 15.99 grams(e10192), 9.16 grams(e10189), 12.16 grams(e10190), and 12.20 grams(e10190) respectively making them the largest natural nuggets to pass through our estate department. You can purchase them individually or as a group for spot price (check the current spot price here) plus 25% and applicable taxes. Available in Canadian or US dollars. They make a great gift for the hard to buy for and the gold bug in your life. You could buy a good used car for the price of these 10 gold coins but we all know what sort of investment a used car is. Ten years ago that car cost $40000.00, today it’s worth $16000.00 (if you’re lucky), ten years from now it’s worth a couple hundred bucks at the scrap yard. Today all 10 coins will cost you less than $16000.00 CAD. Ten years ago they would have cost about $7000.00. Who knows what they’ll be worth in 10 years, but I imagine they’ll be worth a whole lot more than that rust bucket you thought was pretty cool. Coins don’t rust, they don’t break down, and you don’t have to fill them with fuel every week. You can buy them as a passive investment and sell when the time is right. 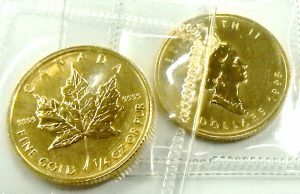 We have 1 ounce fine gold Canadian maple leaf coins from time to time but seldom do they show up in a tube of 10 from the Royal Canadian Mint. The best part about a fine bullion purchase like this is there is no tax. It’s a true investment that is looked upon by the government as a financial transaction not subject to any form of sales tax. The cost for each coin changes with the price of gold. 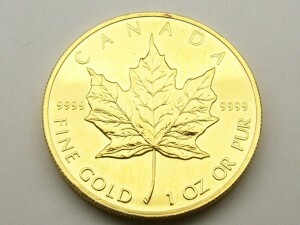 You can check the current price of pure gold in Canadian dollars or most other international currencies at Kitco.com. Each coin is priced at current “spot price” plus 4%. We can accept payment in both CAD or USD. We are unable to accept credit card payment for these coins. Everyone should own some gold bullion as a small component of your investments. Buy one, buy 2 or buy them all. First come first serve. Stock #e10177-e10186. 2009 1/2 oz. Canadian Maple Leaf coin 9999 spot + 8%. Canadian bullion coins really are the best in the world. Canada was first in the world to produce a coin of 99.99% purity. We get them in from time to time, mostly in the full 1 ounce size. The fractional sizes are far less common but equally attractive with their scaled down size. 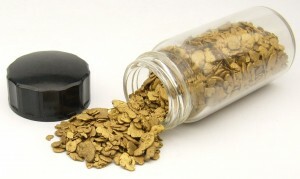 Some examples are as small as 1 gram (0.03215oz.). This half ounce example was struck in 2009 and is in perfect condition. As far as we can tell the coin has never been handled. The pictures were taken through the protective plastic container. It comes in a royal blue velvet box that will make a great keepsake for anyone who loves coins or gold. One only, first come first serve. The coin is estate priced at the current gold market spot price plus 8%. There is no sales tax for a fine gold purchase like this. Payment by credit card will incur a 2% additional service fee. Stock #e10199. 1/2oz. 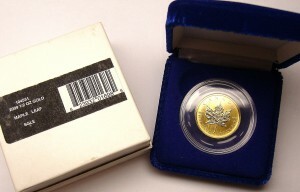 9999 fine gold Maple leaf coin in presentation box. Spot plus 10%. 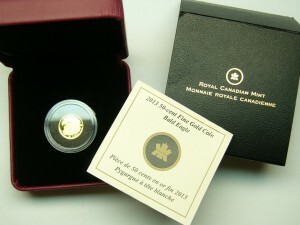 The Royal Canadian mint have been making fine gold coins since 1979. 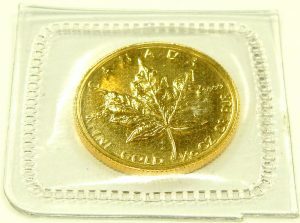 Over the past 37 years they have minted over 25 million ounces of the coins with a total value today of over 40 billion CAD. 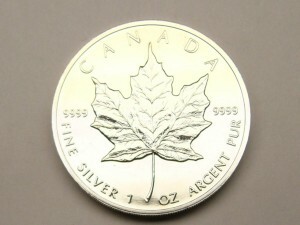 The Canadian Maple leaf was the world’s first bullion coin to achieve a purity level of 99.99%. 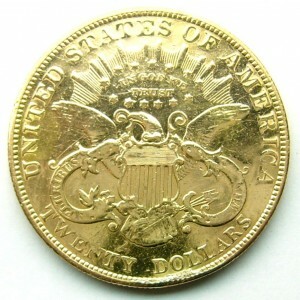 They are one of the most sought after pure gold coins, popular coins with gold bugs and collectors from around the world. 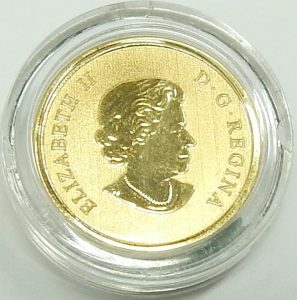 This particular 1/2 ounce example dates from 1986 and is the first year the 1/2 ounce size was produced. Our example comes in a perfect condition solid wood hinged box with a dark brown velvet lining and soft felt protectors on the feet. 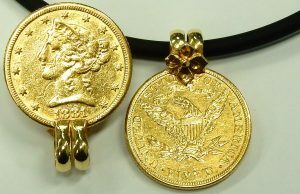 It would make a great presentation gift for anyone who loves gold or coins. We usually only see these coins in full 1 oz. sizes. When they occasionally show up in fractional sizes they are in various states of circulation condition. This one is perfect, still in its sealed plastic container. Not a scuff, scratch or smudge anywhere to be seen. This coin would make a fantastic gift for the difficult to buy for. Price of this coin changes with the price of gold. It is priced at spot gold price plus 10% and NO TAX! Bullion purchases like this are looked upon by the government as a financial transaction therefore are not subject to any form of sales tax. 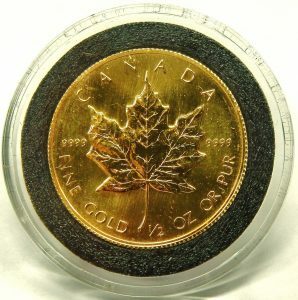 To check the current price of gold click on Kitco.com You’ll be able to get an up to the minute gold price in Canadian dollars and other major currencies. We only have the one example, first come first served. Stock #e9703. 2 x 1 gram 999.9 fine gold bars. Spot plus 5% NO HST!!! Did you take advantage of the recent gold run? 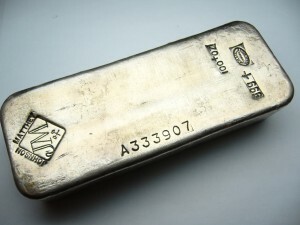 How about getting your feet wet in the bullion market with a couple 1 gram bars. That’s right 1 gram not one ounce. They are the most affordable way to own a little bit of pure gold. 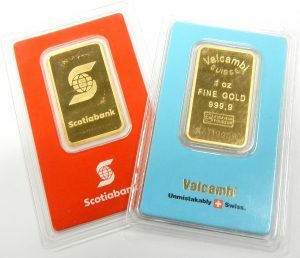 You can go online a karatbars.com and pick these up for over $66.00 US dollars each (Feb 19 2016) or come in and buy them for only $57.00 Canadian (based on current $1690.00 CAD per ounce gold price). You won’t find a better value for gold in this form. Each bar is sealed in its original credit card size tamperproof package. They’re really cool and would make a great gift or a starting point for you own little stash of gold. To check the current price of gold click here. 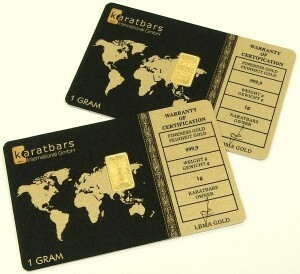 We only have these 2 bars from karatbars international for sale as a pair only. We have a few other 1 gram waffers from different manufactures in stock too at spot price plus 5% and no tax on any kind. Stock #e9488. Four $100 Canadian coins. Selling for gold value only. NO PREMIUM!!! Collection of four $100 Canadian gold coins. Two coin are 22 karat and contain 1/2 ounce of pure gold and two are 14 karat and contain 1/4 ounce of pure gold. They date from 1985, 1986, 1987, 1988. Each come with the original plastic protective case. They are all in perfect condition and being sold for spot price only. No premium added. Each sold separately. Stock #e6377. Four $100 Canadian coins. Selling for gold value only! 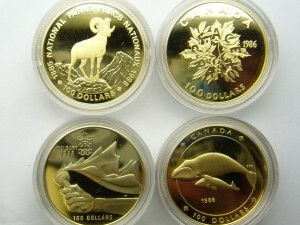 Collection of four Canadian $100.00 gold coins each coin is 22 karat and contains 1/2 ounce of pure gold. They date from 1981, 1982, 1983, 1984. Each one comes with the original plastic protective case. They are in perfect condition and are being sold for spot price only. No premium added. Each sold separately. Stock #e6372, e6373, e6374, e6375. In January 1979 gold was trading for around $225.00 USD per ounce. By early 1980 it had shot up to $850.00 USD. Not a bad return if you timed the market correctly. If you bought gold a few months after the 1980 high at $500.00 USD it would have taken you around 25 years to get your money back when in 2005 it broke through the $500.00 barrier again. What does all this mean? I have no idea, but gold really hasn’t done much in the last few years and the world is a much more complicated place than it was the last time gold spiked. There are billions of people around the world who don’t trust paper money and they all want gold. It’s not a bad idea to hold some of this precious metal as an alternative to cash. Buying pure gold like this is tax free, there is no sales tax on precious metals like gold, silver and platinum. 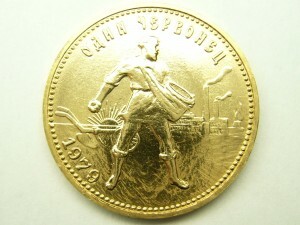 This 1979 coin is priced at the current price of gold plus 4%. An interesting website that follows the gold price is kitco. You can see the current price of gold in Canadian dollars along with excellent historical charts and commentary on precious metals. Holding a little gold is a great way to protect yourself against inflation when it takes more and more paper money to buy what you need. These coins can be difficult to find and we don’t always have them in stock. Stock #e9339. 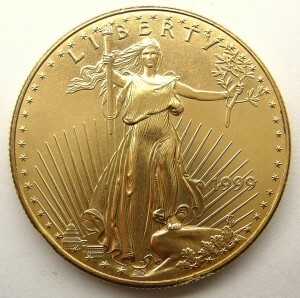 1999 US $50.00 gold coin containing 1oz. of fine gold. Spot plus 4%. We’ve said it before and we’ll say it again. “Everyone should own some gold”. Not just because it’s beautiful to look at but it feels great between your fingers and it could be a great investment too. Investing in the stock market is a key element to many investment portfolios, but one could also argue holding a little gold is important. After all, even the oldest companies can’t compete with the 5000 year history that gold has as an object of considerable value. Although the value of gold is always changing against what it is typically compared to (paper currency). It has always been welcomed for trade in almost all cultures for any other commodity you may need. You can’t just print more gold. It’s a good way to offset the affects of a weakening dollar and inflation. We don’t see many US coins around here and are happy to offer this 1999 22 karat US $50.00 coin that contains exactly 1 troy ounce of the precious metal. A beautiful likeness of Lady Liberty shows on the obverse side with powerful images of the majestic bald eagle on the reverse. In good condition showing great detail. There is a small dent at the 11:00 edge at the ST likely caused by a drop on a hard surface. This is high karat gold and is very soft so handle with care. The price of this coin changes everyday with the price of gold. We are pricing it at the “spot” price of gold plus 4%. You can check the current price of gold anytime at Kitco. We can accept payment is both US and Canadian dollars. Stock #e9233. 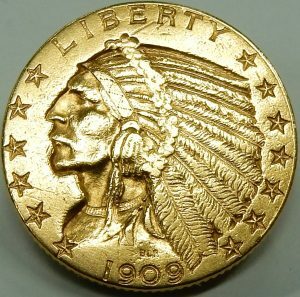 1904 $20.00 U.S. gold coin $1600.00 CAD. If this coin could talk imagine the stories it would tell. Doing a little research into 1904 reveals quite a different world than now. Some interesting facts about 1904. Only 8% of U.S. homes hand a telephone. The average wage was only 22 cents an hour. 20% of the U.S. population couldn’t read or write. There were only around 8000 cars in the U.S. and this $20.00 gold coin would have represented approximately 7% of the average U.S. worker’s yearly wage. 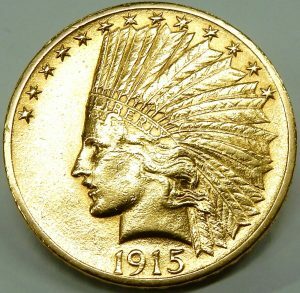 An interesting comparison is that today the value of gold in this coin is equal to around 3% of the average U.S. income of around $44000. 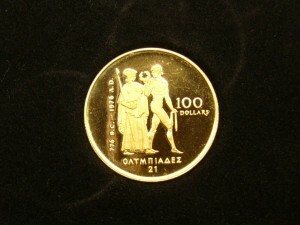 The coin measures a little over 34mm diameter and weighs 33.4 grams made from 90% pure gold. When this coin came to us it was in a frame bezel that was soldered shut. 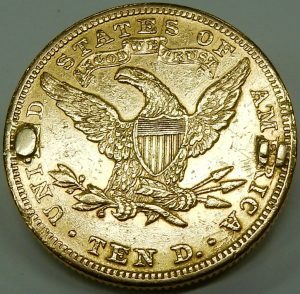 A trace amount of solder contaminated the edge of the coin and on the eagle side at the “DO” in DOLLARS (see photo). The solder is very hard to see and does not diminish the beauty of the coin. Estate priced at $1600.00. Stock #e7932. 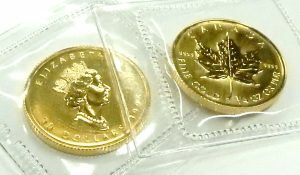 Fractional ounce fine gold Canadian coins almost never come in. When they do they are usually not perfect with typical evidence of use in the form of small scratches and dings. 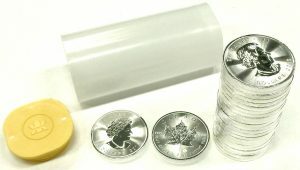 We just picked up a couple 1/2 ounce 9999 purity $20.00 Canadian Maple leaf coins and a couple 1 ounce $50.00 coins that are in excellent condition. They are all still in their original plastic containers with presentation boxes. 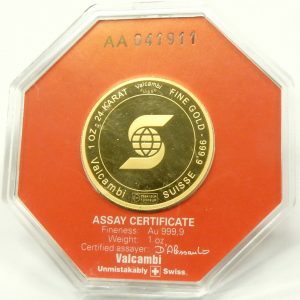 If you have any interest in obtaining a fine gold coin of 99.99% purity BUY ONE OF THESE COINS. You will not find a better example. 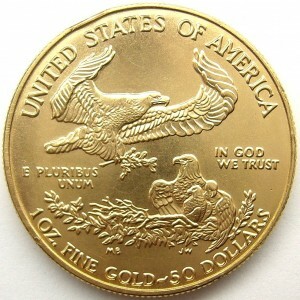 Bullion coins such as this are tax exempt and the price fluctuates every minute with the price of gold. We are selling these coins for the commodity price only plus 4% and NO TAX. 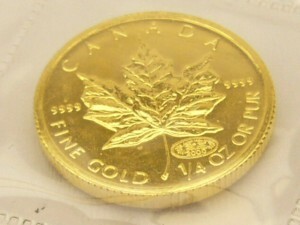 The current price of gold in Canadian dollars can be seen here. 1 ounce coins come in on a fairly regular basis but smaller 1/2 ounce examples are very rare. We can’t repeat this offer, first come first serve only. No holds. Stock numbers e9044, e9045, e9046, e9047. The Pan Am games just finished up yesterday and the 2014 Sochi Olympic winter games are just a memory now. What a great Pan Am showing for Canada finishing 2nd place overall. Congratulations to all our Canadian athletes. We’re all so proud of your accomplishments and the great display of sportsmanship displayed throughout the games. It was hard not to catch the spirit of the games. We have the odd Olympic coin come in from time to time but a full set like this is quite rare. 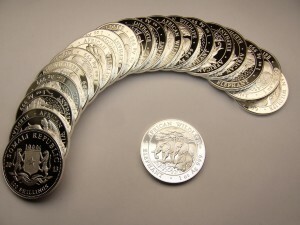 The 28 different coins are each made from 92.5% pure silver and contain over 1 kilogram of sterling silver in total. They commemorate Canada’s first Olympic games held in 1976 at Montreal. They come in proof condition all sealed in their original plastic containers. A leather grain presentation box with gold embossed Olympic logo is included for the estate price of “spot” silver quote plus 10%. 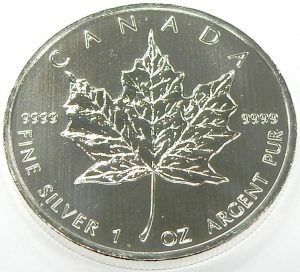 The current spot price of silver can be seen in Canadian dollars here. 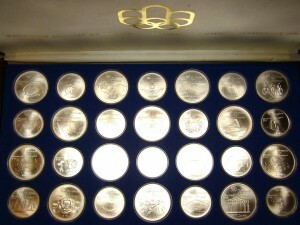 Pricing of silver changes almost every minute, check out the price and keep the Olympic spirit with this vintage set. Stock #e9010. 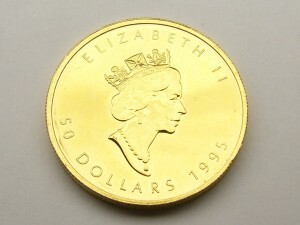 1995 Canadian fine gold 9999 coin. Spot plus 4% and NO TAX. It’s hard to believe that 1995 was 20 years ago. Back then gold was trading at around $500.00 per ounce Canadian and century old Canadian telecommunication company Nortel was trading on the stock market for around $38.00 per share. 5 years later Nortel was trading at over $1200.00 (after accounting for a 10 for 1 reverse stock split in 2006). Today those shares are worthless. During the same 20 year period gold had a less exciting valuation from around $500.00 to almost $1900.00 and now is around $1430.00. Investing in the stock market is a key element to many investment portfolios, but one could argue holding a little gold is also important. After all, even the oldest companies can’t compete with the 5000 year history of gold as an object of considerable value. Although the value of gold is always changing against what it is typically compared to (paper currency). It has always been welcomed for trade in any culture for any other commodity you may need. You can’t just print more gold. It’s a good way to offset the affects of a weakening dollar and inflation. When purchasing precious metal of this purity it has the added benefit of being tax exempt. No provincial or federal Canadian tax will be added. Coins like this come in far less often than gold bars and wafers. So if you would like this one, come in ASAP. Sold at the current spot price for gold plus 4%. An up to the minute gold price can be seen here. Stock #e8968. Occasionally unusual coins surface with our estate offerings. Most are not worth any more than the metal they are made from. These two came in with a some old worn out pieces of jewellery that were gathering dust. Looking at the tarnished surfaces I would say they’ve been gathering dust for half a century or so. 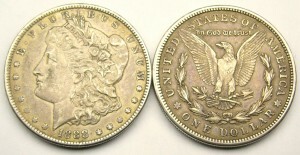 These United Stated silver dollars are known as Morgan dollars named after the designer George T Morgan assistant engraver for the US mint. 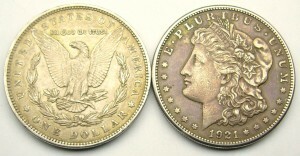 The 1888 coin is one of almost 32 million minted that year. The 1921 is one of over 86 million. They are 90% pure silver and 10% copper making them a little more durable. We are not coin experts and these have not been expertly assessed, but they look pretty good to me considering they are 127 and 94 years old. 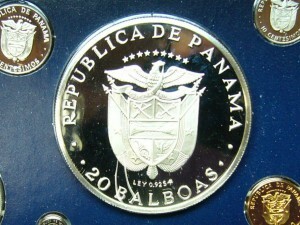 With silver selling for around $20.00 per ounce these coins contain approximately $30.00 of the precious metal. Having an older item or two like this is just kinda fun. Even if you are not a coin collector they have a special attraction. The age, the patina, the large 38mm size and the heft just make them different than the base metal coins we use today. They came in together and they are being sold together only for the estate price of $100.00. How’s everyone feeling right now about investing in the stock markets? Since early September Canada’s TSX stock index is down 11.5% (as of Oct. 15 2014). Are you nervous about world events? Maybe now is the time to get your feet wet in the world of precious metal investing. I’m not suggesting that you take investment advice from a small town jeweller but here is a fun way to diversify your assets with a tangible item. This is one of the world’s most pure gold coins, in fact it’s 99.9% pure. That means when it is sold NO HST is collected. Canada Revenue Agency looks upon this as a financial transaction therefore not subject to any tax. People have used gold as a means of payment and trade for around 5000 years. Paper money has only been around for a couple hundred years and is really just a promise note guaranteed by the issuing government. Everyone should have at least some gold and silver with their other investments. These coins are also just really cool, they are only slightly bigger than a Canadian $2.00 coin but they weigh almost 4.5 times as much. They are very sought after and don’t come in very often. The price of these coins changes every minute. We are selling for the “spot” price gold is trading plus 4%. 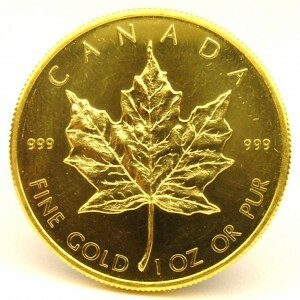 To see the current price of gold in Canadian dollars have a look at Kitco. First come first serve on this very good example that dates from 1979. 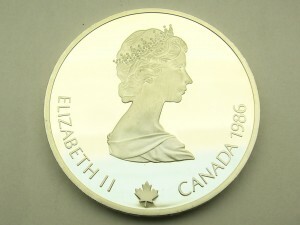 The 1979 issue is the first year of production for Canada’s bullion coin and depicts a young 39 year old Queen Elizabeth II. Imagine the next time you call heads or tails with this coin. Who knows it might also make a good investment too. Stock #e8563. Did the red flags, bells and whistles ever go off when all these came in. Talk about an unlikely source of fine silver coins. The republic of Somali is not generally known for their minting of precious metal coins. In fact, we didn’t even know these coins existed until they came in, let alone ever see dozens of perfect examples. We have a limited number of these beautiful 1 ounce fine silver coins that were minted in Germany 2013. They are in perfect condition still in their 20 coin shipping tubes. At current silver prices they often trade hands for $30.00 Canadian each. When these are gone we are unable to replace. They are being sold for “spot” silver price plus 15% and no taxes of any kind. We don’t charge tax on coins and bullion that is a least 99% pure. 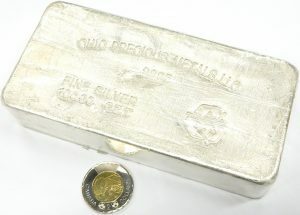 For an up to date spot price for silver, gold and other precious metals in Canadian dollars click on Kitco. 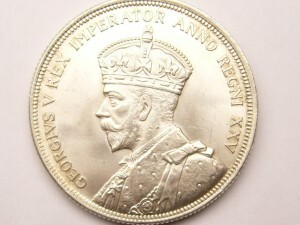 Coins like this are always in demand and are easily sold if the price of silver goes up. They’re a fun way to get into the bullion market. Estate priced at spot plus 15% and no tax. An unusual item for sure. Recently a customer came in with odds and ends from their mother’s estate. Among the small jewellery items and loose silver coins was this unopened roll of commemorative 1967 Canadian centennial silver dimes. 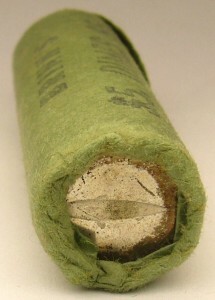 The 50 dimes in this roll have likely been wrapped up in the green paper BRINKS roll for over 40 years. 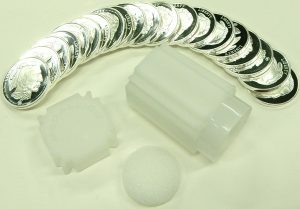 Each coin in this roll weigh 2.33 grams and is made from either 80% or 50% fine silver. With the increasing value of silver the composition of these coins changed from 80% pure to 50% part way through 1967. Some quick math suggests this roll contains 1.86 to 3 ounces of fine gold worth around $38.00 to $62.00. These coins are not rare but of the almost 63 million minted many have been recycled for silver salvage. Not many have survived in a vintage paper roll like this. 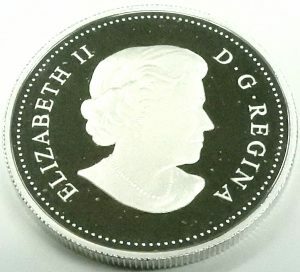 This would make a great gift for someone born in 1967, a coin collector, or someone who wants to invest in the silver market with a unique group of dimes that should always sell for a premium over just the silver value. Estate priced at $75.00. 10 ounce fine gold bar spot plus 0%!!!!! That headline is correct spot plus zero, nothing, nada. No commissions, no service fees, no shipping charge if you pick it up in person. There are no taxes on a bullion purchase like this. The Canada Revenue Agency looks upon the purchase of fine gold and silver for that matter as a financial transaction therefor not subject to any tax including the HST. The RRSP deadline has past, if you didn’t contribute to that investment vehicle how about an investment in gold? This truly is an investment. It’s a great opportunity to diversify your holdings. It’s an investment that you can touch and hold. Like all financial transactions we are unable to accept credit card payment for this item. Payment must be made in cash, debit card, bank wire or certified cheque. Here’s something to think about. Paper currency has no intrinsic value, it is only a promissory note guaranteed by the government that issued it. If that currency happens to be issued by the Canadian government for instance, you’re holding a tiny part of the almost 800 billion dollars of debt Canada has. The spot price of gold changes every minute. 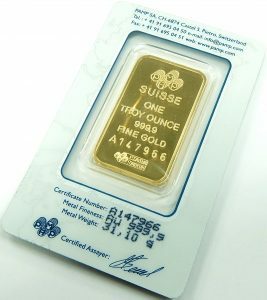 For an up to date spot price click on http://www.kitco.com/market/cad_charts.html We have one and only one 10 ounce gold bar in stock. This is a one item offer we are unable to repeat. Stock #7986. I can’t believe it’s been over 25 years since the 1988 Calgary winter Olympics. The Canadian mint makes some of the finest quality commemorative silver and gold coins in the world. This is just one example of the fine detail they are able to achieve. 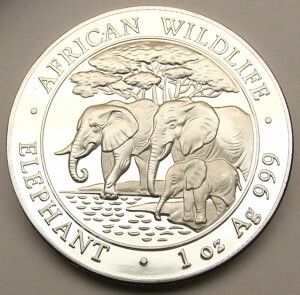 The coin measures 40mm diameter and is made from 33.63 grams of sterling silver. The 2013/2014 season is just around the corner and this would make a great gift for any hockey fan. You don’t need to be a coin collector to enjoy a piece like this. 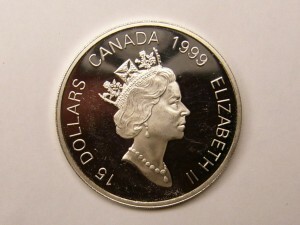 The coin is legal tender in Canada and has a face value of $20.00. Only two years ago this coin had over $40.00 worth of silver in it today the coin can be purchased for the estate price of only $30.00. A Canadian gold coin with an iconic symbol of the USA this coin is an oddity indeed. The strange denomination of only 50 cents is a bit unusual too. This is a small coin measuring only 13.92mm diameter but big on quality being 99.99% pure and therefor not subject to the HST. Limited in quantity to 10000 and mostly sold out. The Canadian mint has a few of these 1/25 oz. 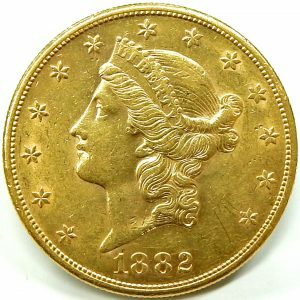 pure gold coins left on sale for $129.95 plus shipping. This coin is complete with it’s original box, sleeve and certificate. Untouched in perfect condition sealed in the plastic container it was delivered in. Estate priced at $99.00 with no added tax or fees. This coin just screams communism in some of its most basic concepts. The bare foot worker sowing seeds by hand in a field with the sun rising in the background. A distant factory with smoke drifting gently to the east. This is no subtle subliminal message. The coin dates from 1979 when the cold war was still on everyone’s mind. I was a young kid back them but I remember the fear and threat of nuclear weapons. A little over 20 years later and no more communist Russia. This is not the most rare coin but they sure are scarce around here. It would make a great conversation piece. 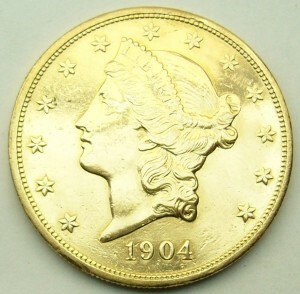 The coin is made of 90% pure gold and contains 0.2489 ounces of gold. This coin is estate priced at spot price plus 20% and is subject to HST. 999.9 Fine Gold Waffer Kuwait City. 5% Over Spot. For all the gold bugs around here is an opportunity to get a very unusual gold wafer. 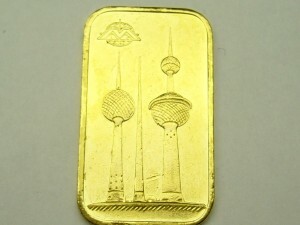 The 10 gram 999.9 pure bar depicts the towers in Kuwait city. This bar is HST exempt and is estate priced at spot gold price plus 5%. I have never seen a wafer like this before. One of 336,448 produced for this the final year of the “Coronet Head” design for this coin. Not exactly rare but consider that the next year in 1908 Henry Ford introduced the model T eventually making over 15 million of the cars. When was the last time you saw one of those around? Most of these coins have likely been lost, melted down or are just worn out. We are not coin experts at Bill Le Boeuf Jewellers but this coin looks to be in very nice condition showing excellent detail on both sides. 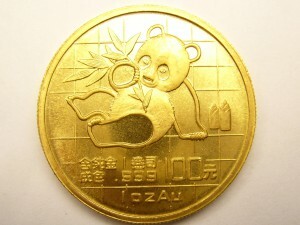 The coin is made of 90% pure gold and weighs 4.16 grams. At today’s gold price it contains $170.00 dollars worth of the precious metal. Estate priced at $300.00. Stock #e7822. I don’t like to tease our customers, but by the time you read this posting it likely will be already be sold. 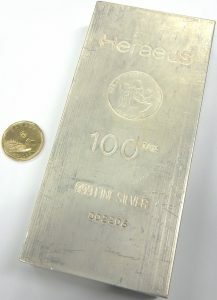 So strong is the demand for pure silver bars, wafers and coins, as soon I we get something like this in it is gone. Royal Canadian Mint bars almost never come in especially one of 100 ounces. This bar weighs almost 7 pounds. We are pricing this bar at the spot price plus 10%. There is no HST on this sale as Revenue Canada looks upon this sale as a financial transaction therefore not subject to the HST. Estate priced at spot silver price plus 10%. 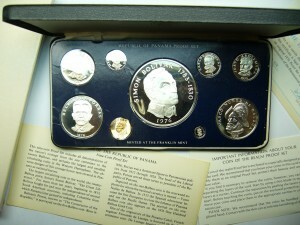 I’m pretty sure most coins from Panama are not particularly collectable but this set has a couple things going for it. First thing the set has to offer is three of the nine coins are sterling silver and contain 5.69 oz. of actual fine silver held within. The coolest thing about the large coin is; it just so happens to be the largest circulating coin in the world according to the documentation accompanying the set from 1976. It measures over 6cm in diameter. Imagine flipping that at your next coin toss. This proof is sealed in plastic and comes with all it’s original certificates and packaging. Estate priced at $175.00. Stock number #e7771. First come first serve. If you have any interest in obtaining physical silver you know how hard it is to find this type of thing. We only have this one bar offered. 50 troy ounces is the better part of 3.5lbs. This is an HST exempt sale. Short and sweet. Fine silver coin. Spot plus 10%. NO HST. First come first serve. 1 only. One of the world’s most sought after coins is the Chinese Panda. This coin is 1 ounce of 99.9% pure gold and therefore HST exempt. This one dates from 1989 and is in good shape. The coin is a little larger than a Canadian $2.00 coin but is over 4 times as heavy. I have had a few of the smaller pandas over the years but I can’t remember having a full ounce to offer before. 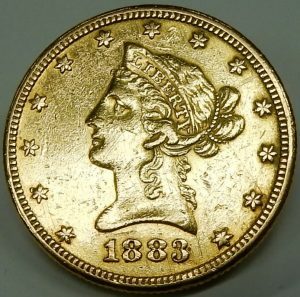 The estate price on this coin is spot price plus 2%. 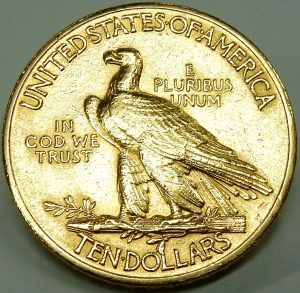 U.S. 1/10th Ounce gold coin (spot plus 10%). 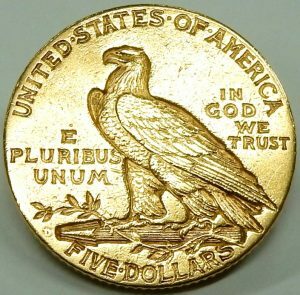 U.S. $5.00 gold coin containing 1/10 ounce of fine gold. This one dates from 2003 and is in great condition. Estate priced at spot market plus 10%. These coins are not rare but are just plain cool, they are a little smaller than a Canadian dime but are twice as heavy due to their gold content. One 999 silver ingot 1000 grams. This bar weighs over 32 ounces. It is from Degussa refinery in Germany. 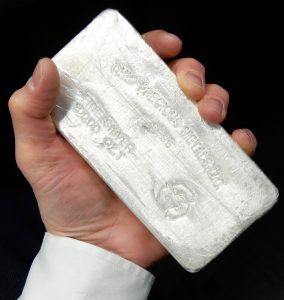 Since this is a 99.9% pure silver bar there is no HST on it’s purchase. It is estate priced at spot plus 15%. All I can say is WOW. 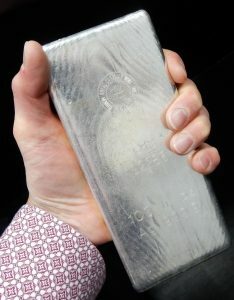 100 oz bars of fine silver don’t come in often. This thing is about the size of a stick of butter but weighs the best part of 7 pounds. Silver is almost impossible to find in bigger size bars and I don’t expect to have this one long. 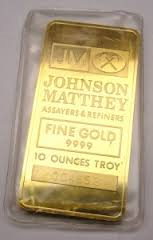 The bar is stamped JOHNSON MATTHEY 999+. This is an HST exempt sale as the Canada revenue agency considers this a financial transaction and therefor not taxed. Estate priced at spot plus 15%. Not a rare coin but these are getting very hard to find for sale. This one is just a bit more special because it’s a year 2000. This is one of the most pure coins available in the world. If you ever wanted one this is a good opportunity and it’s still sealed in the original package. These coins are HST exempt due to their fine gold content. Estate priced at spot plus 10%. 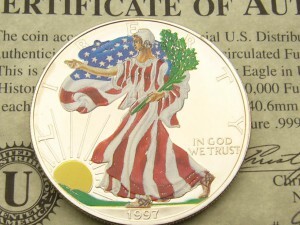 Silver 999 liberty coins are hard enough to find for a decent price but how about a limited edition painted version? This coin is just beautiful and I wanted to keep it for my self but I can’t fall in love with my inventory. So here it is. This coin is in perfect condition without even a scratch. It comes in a protective plastic case with a certificate of authenticity (#9414/50000). This coin is not especially rare but I have never seen another. Most have been squirrelled away never to be seen. 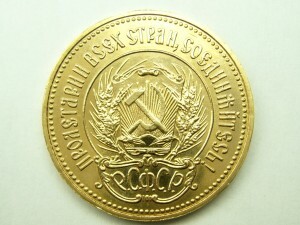 The coin dates from 1997. This will be a no HST sale. Estate priced at spot silver price plus 20%. OK sports fans here is your chance to own a piece of history. Can you believe its been 19 years since the Jays won the world series. This is a limited edition 999 fine silver coin weighing 1 oz. There is no HST on this sale. 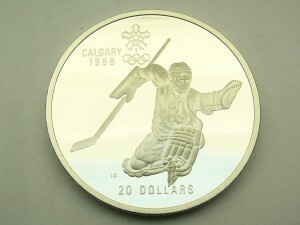 Don’t hold your breath for a Maple Leaf Stanley cup championship version of this coin. This one is estate priced at spot silver price plus 20%. This is what it is all about. Pure gold from Credit Suisse. 1 oz. of 99.99% gold. Comes with assay certificate from Zurich Switzerland. It is offered for sale a 3% above spot gold price and is HST exempt. The 14 karat frame weighs approximately 2.8 grams and is available also for $100.00 extra. 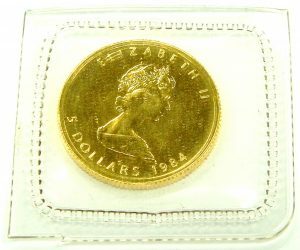 Before there were Canadian maple leaf gold coins this coin was one of the most desirable. 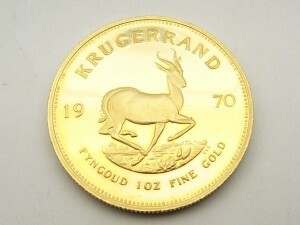 The South African Krugerrand contains 1 troy ounce of fine gold and trace amounts of copper and other metals. It is 22 karat gold and 91.7% pure. These coins have no monetary denomination and trade mostly with the price of gold. 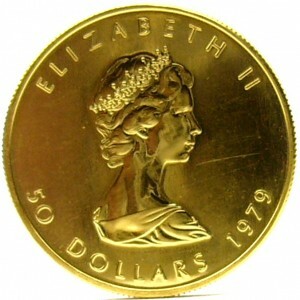 When this coin was new gold was trading under $50.00 per ounce. If only I knew what it would be selling for next year. The estate price for this coin is spot market value only. We do not add any premium. It is being sold for it’s gold value only. 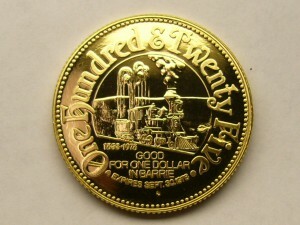 A complete example of the 1978 Canadian unification $100.00 gold coin. It weighs 16.96 grams and is made from 22 karat gold. Certificate and leather box are included. Estate price spot gold price only, no premium added.